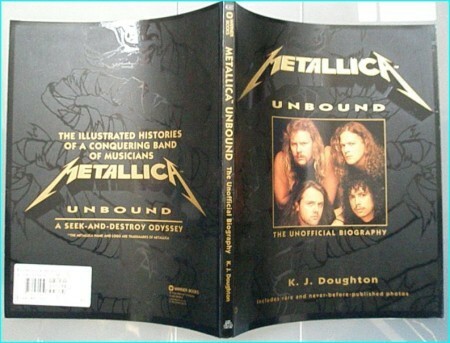 Home / Other Items / Books / METALLICA: Unbound BOOK The Unofficial Biography [Paperback] K.J. Doughton. Masterful, a real must have for Metallica fans! ONE WINTRY EVENING in 1973, Deep Purple roared through a concert performance in Copenhagen, Denmark. I have been a fan of Metallica since the release of their fourth studio album “..And Justice For All.” in 1988. At once I devoured the album and went back through their catalog of albums, including “Garage Days.” This book is very thorough and informative; it gives a glimpse into the world of early Metallica that no other source does. I have tapes of the early San Fransisco shows at the Waldorf and the Stone, and this book puts everything in perspective. Doughton, the ultimate fan himself, knew what fans wanted from a Metallica biography and he delivered right on target. And that is without mentioning the incredible, never before seen photos. Too many fans of Metallica do not know anything about the band prior to “None More Black.” (The real unofficial title to the bands eponymous 1991 release.) While I have just as much respect for new fans as old, I think the new fans owe it to themselves to buy and listen to “..And Justice for All” ,”Master of Puppets”, “Ride the Lightning”, and even “Kill ’em All”. I am confident that new fans will appreciate and love the music. This book is the perfect companion to the music. So I am confident they will love it as well. this book is excellent i bought it because of all the great pictures ,and then when i started to read it i couldn’t put it down.Also lots of information that even the biggest metalli-fan wouldn’t know. I think Metallica Unbound was a wonderful book, for fans and newcomers alike! It tells the complete history from the humble begenings to the black album. I greatly recommend this book to anyone, especially fans of metallica!!! K.J. really knows Metallica pretty well. This book is filled with the most and the best info on the bands any fan would want. Most of this info you wouldn’t even hear from the band that much. This boook is for the littlest Metallica fan to the Die Hard long time Metallica fan. After reading this book I have found out a lot of stuff about Metallica and thier roots. Coming from the town where the first Fan club had come from and where somewhat the beginning of Metallicas history had begun this is the book for all people Metallica fan or not. Authored by the person who ran Metallicas first fan club in the early to mid-80s, Metallica Unbound is a view of the bands rise to fame from someone who was there from Day One. The book also includes chapters written by other “original” fans and friends who witnessed the bands early club performances in San Francisco and their subsequent rise to worldwide fame. Also featured are many rare photographs that have never been published anywhere else. This is a MUST read for any Metallica fan.